Introduction: The tumors of the soft palate can be classified according to its benign and malignant behavior. The most frequent benign tumors are the papillomas; the mixed tumors (pleomorphic adenoma) and the schwanomas. Among malignant tumors, 95% are squamous cell carcinoma and the 5% left are represented by minor salivary glands tumors, lymphomas, melanomas and other rare entities. Objective: The objective of this work was to evaluate the frequency of benign and malignant tumors of the soft palate, as well the most frequent kinds of tumors in each group and to relate them with age, gender and macroscopic aspect. Method: A retrospective analysis included the patients seen at the Head and Neck Surgery clinic of the Institution. Results: From the 43 patients, 10 of them presented malignant tumors (23%) and 33 presented benign tumors (77%). Among all of the tumors, 26 were papillomas (60.5%); 9 were squamous cell carcinomas (21%); 4 were hemangiomas (9.3%); 2 were pleomorphic adenomas (4.6%); 1 was adenocarcinoma (2.3%) and 1 was lipoma (2.3%). Conclusion: It was noticed that epithelial tumors are the most frequent in both malignant and benign groups, what is related to the predominant epithelial tissue in soft palate. Tumors of the soft palate can be classified as benign and malignant. The benign tumors are extremely rare when compared to malignant ones. The most frequent are the papilloma, mixed (adenoma and pleomorphic) and schwannoma tumors. Although they are rare, their variety is large due to the different tissues that involve the area: epithelial tissue (papillomas); conjunctive tissue (fibromas and lipomas); nervous tissue (schwannomas and neurofibromas) and vascular tissue (hemangiomas and lymphangiomas) 1. The papillomas are benign neoplasm that commonly occurs in the orpharynx, and the soft palate is the most affect area, whose aspect is vegetation-like. There is a clear evidence of HPV and spinocellular carcinoma relation, and the HPV 16 is the most important one2. The limpoma tumors are more commonly found in the posterior and lateral wall of the oropharynx; they originate on the adipous tissue and are involved by a capsule, and can also be submucous1. The hemangioma is a rare tumor in the oropharynx, and in this case the soft palate is a less common affected area. Its histological aspect may vary from papillary to cavernous type1. The spinocellular carcinoma (SCC) represents 95% of the malignant tumors are and 5% refer to tumors of smaller salivary glands (Cystic adenoid carcinoma, mucoepidermoid carcinoma and adenocarcinoma); lymphomas, melanoma and other rare entities3,4. The smaller salivary gland tumors have a submoucous mass aspect, with a smooth surface and asymptomatic when in small size; they can develop as a small ulcerated area by trauma. In general terms, 50% to 70% of the tumors are malignant. They affect more female than males at their 50s as average5. The SCC of the soft palate can, at naked eye, present a superficial ulcerated, exophytic, ulcerovegetative or ulceroinfiltrative aspect. Due to the few occurrences of primary tumors of the soft palate and the absence of anatomic barriers, which prevent tumor extension inside the oropharyx, some authors correlate the subsites as oral cavity, larynx, hard palate and others6. There few studies regarding only the soft palate. It affects more male than females (3:1) between 55-70 years old. It is related to tobacco and alcohol consumption and the main symptoms are local pain and odynophagia. At the diagnosis, most of them are T2 or T3 and 50% invades beyond the soft palate7. The target of this study was to evaluate the occurrence of malignant and benign tumors of the soft palate, as well as the most common types in each of the two groups, and also to relate them with age, gender and macroscopic aspect of the lesions. It was performed a retrospective analysis between the years 1995 and 2005 of the patients assisted in the ambulatory of Head and Neck Surgery of the institution. In order to do such analysis, the medical records of patients together with the Serviço de Arquivo Médico e Estatística were used. It was included 43 patients with tumor on the soft palate according to the physical exam description at the moment of the first visit. The type of tumor was classified in accordance with anatomo-pathological report by the Pathological Anatomy Department of this institution. From those 43 patients, 10 (23%) presented malignant tumors and 33 (77%) presented benign tumors (Chart 1). Among all types of tumors, 26 (60.5%) were papillomas; 9 (21%) were SCC; 4 (9.3%) were hemangiomas; 2 (4.6%) were pleomorphic adenoma; 1 (2.3%) was adenocarcinoma and 1 (2.3%) was lipoma (Table 1). From the 43 patients, 35 of them (81.4%) presented epithelial type (papilloma and SCC epithelial; and from nine patients with SCC, one of them was diagnosed of verrucous carcinoma. It was observed a higher frequency of tumors of the soft palate in patients aging from 41 to 60 years, what accounted for 67% of the cases. The benign tumors, especially the papillomas, were the most frequent in this age group, followed by the group from 61-80 years, which accounted for 26%. 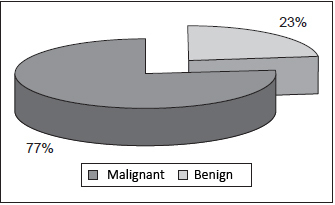 The occurrence of benign and malignant tumors was almost the same (Table 2). Among malignant tumors, there was a predominance of SCC in patients aging fro m61-80 years and the patient with adenocarcinoma was 59 years old. Regarding gender, there was a discreet predominance of males (53%), while females referred to 47%. In the malignant tumors, there was predominance of males in the cases of SCC (affecting 7 males and 2 females) and only one case of adenocarcinoma in a female patient. The benign tumors affected 20 females and 13 males. When physically examined, patients with SCC presented ulceroinfiltrative lesion (4 cases), ulcerovegetative (4 cases) and verrucous aspect (1 case). The patient with pleomophic adenocarcinoma presented bulging with no ulceration. The lesion's aspect of the pleomorphic adenomas (2 cases) was similar to the adenocarcinoma aspect. Patients who were diagnosed of hemangioma presented a purple-bluish lesion with imprecise limits. The papilloma tumor that affected 26 (60.5%) patients from the samples presented verrucous lesions; and its color varied from white to grayish. The tumors of the soft palate are uncommon neoplasm, and there are few reports about it in the literature. In general, these tumors are mentioned in studies of other sites of the oropharynx. It does not present enough material when tumor is exclusively of the soft palate. This study only reports tumors of the soft palate, thus its material is restricted. In this sample, the benign tumors prevails malignant ones, which disagree with the literature. A possible explanation for such fact is that, in our institution, the ENT and head and neck surgery services work together, what increases the benign lesion prevalence, such as the papilloma that was present in 26 out of 43 cases. The benign tumors presented several histological types: papilloma, hemangioma, adenoma and lipoma, the latter was the most common (78.8%), which agrees with Noronha and cols, 2003(1). In spite of being found only two different histological types among the malignant tumors, there was a predominance of the squamous cell carcinoma (SCC) (90%) in relation to the adenocarcinoma, according to the literature2. The SCC affected more males (3.5:1), who aged between 61 and 80. Patients with epidermoid carcinoma of the soft palate often present history of tobacco and alcohol consumption in excess. The risk of affection becomes normal after 10 years with no consumption. The alcoholism has also a relation to the ingested amount, depending on the drink; the distilled drinks represent 4.4 times more risk than the non-distilled ones. The synergic effect of these substances in the creation of the cancer process is well known and it can justify the high rate of a second primary tumor presence3. Regarding the salivary gland tumors, there was only one case of malignant type (adenocarcinoma) and another of benign type (pleomorphic adenoma), which presented 50% of malignancy, despite the lack of material, what agrees with Batsakis (1999)5. Although Adenocarcinoma is the second most common malignant tumor in the oropharynx, there was only one case of it affecting a woman. The histological diagnosis of lesion with features of bulging in the soft palate is extremely important due to the macroscopic similarity between benign and malignant lesions. It was observed a predominance of neoplasm of epithelial origin in both benign and malignant tumors. This is because of the large amount of epithelial tissue in relation to other ones in the soft palate. The macroscopic aspect of the lesions is essential to a diagnosis suspicion and establishment of a probable histopathology of tumor, by allowing a more suitable preliminary instruction and therapy for each case. 6. Sundaram K, Lucent F. Carcinoma of the Oropharynx: Factors Afecting Outcomes. Triological Society Papers: Candidate's Thesis; 2005. 1. Expert in Otorhinolaryngology and Head & Neck surgery. 3. Physician (3rd year resident doctor in Otorhinolaryngology and Head & Neck surgery of the Hospital do Servidor Público Estadual (HSPE) - SP. 4. Physician (Assistant doctor of Head & Neck surgery in the Otorhinolaryngology service of the Hospital do Servidor Público Estadual. 5. Expert in Otorhinolaryngology (Otorhinolaryngologist). 6. Master's degree student by FMRP-USP (Assistant Doctor of the Head & Neck surgery in the Otorhinolaryngology surgery of the Hospital do Servidor Público Estadual de São Paulo. This article was submitted to SGP (Sistema de Gestão de Publicações) of R@IO on November, 11th, 2007 and approved on June, 10th, 2007 at 21:33:01.